In an effort to reduce cervical cancer deaths among women in the developing world, Jhpiego researchers are preparing to recruit a formidable ally in their fight—mothers. The aim of the two-year project is to reach the next generation of women before they contract this deadly disease by vaccinating young girls against the human papillomavirus (HPV), a sexually transmitted virus and leading cause of cervical cancer. Women who have been educated about and screened for cervical cancer will be recruited through a “Protect Your Daughter! Protect Yourself” campaign in Thailand and the Philippines, two countries with strong networks of community health volunteers and cervical cancer prevention programs. The research study is being conducted in partnership with leading cervical cancer experts in Thailand and the Philippines and two university-affiliated health care facilities in the respective countries. A research grant and HPV vaccine are being provided by Merck & Co. for this study. 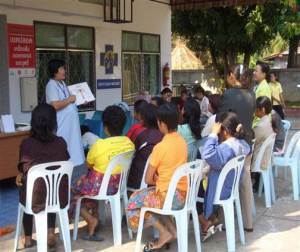 Thai women learn about cervical cancer, a leading killer of women in the developing world. Cervical cancer kills about 274,000 women a year, the majority of whom live in the developing world where Pap tests are costly and not easily accessible. In Thailand, an estimated 2,620 women die annually from cervical cancer; in the Philippines, the number is 3,807. Jhpiego has been working in cervical cancer prevention in Thailand for the past decade. As a result of its partnership with the Thai Ministry of Public Health and faculties of leading universities, 500,000 women have been screened for cervical cancer through the government’s national prevention program. That network of care and experience in service delivery should be an asset in reaching women, their daughters and young female relatives for participation in the vaccine study. In 2005, the Philippine government made a commitment to improve cervical cancer screening services in its country, where the mortality rate from cervical cancer, 15.6 per 100,000, exceeds those of Thailand (8.4) and the U.S. (2.6). Jhpiego helped implement a cervical cancer screening and treatment program in eight sites across the country, with more than 10,000 women receiving services. The reason to target young girls between ages 9 and 13—before they become sexually active—is that the vaccine is ineffective once a girl or woman has contracted the virus. The hope is to have 8,000 adolescent girls participate in the study. Girls whose mothers agree to enroll them in the project also are participating in the cervical cancer screening and treatment program. The study participants will be followed up to ensure that each girl receives all three recommended doses of the HPV vaccine. Education about cervical cancer must be ongoing, Lu says. “Even if you are vaccinated, there is a need for screening. The vaccine is going to protect you only to a certain extent. When you reach a certain age, you still need to be screened,” he says. The last six months of the study will focus on analyzing the data and results of the mother-daughter screening program. “The other underlying goal is to use the data to assist the governments of Thailand and the Philippines to develop their own policies and guidance for introducing the HPV vaccine,” says Lu. Approximately a quarter of Thailand’s 65.7 million people are under the age of 13, and in the Philippines, the numbers are greater, at 35 percent of the population of 88.7 million. The “Protect Your Daughter! Protect Yourself” mother-daughter initiative, therefore, has the potential to help millions of women—working to protect the health of the next generation.